“Fires in Space” by Agnes Pelton (American, 1881-1961), 1938, oil on canvas, 30 by 25 inches. Photo courtesy Stair Galleries. HUDSON, N.Y. — Stair Galleries’ February 17 sale saw an astronomical and record-setting price for a work by Agnes Pelton (American, 1881-1961) when it sold for $276,000, approximately ten times the previous record for the artist. 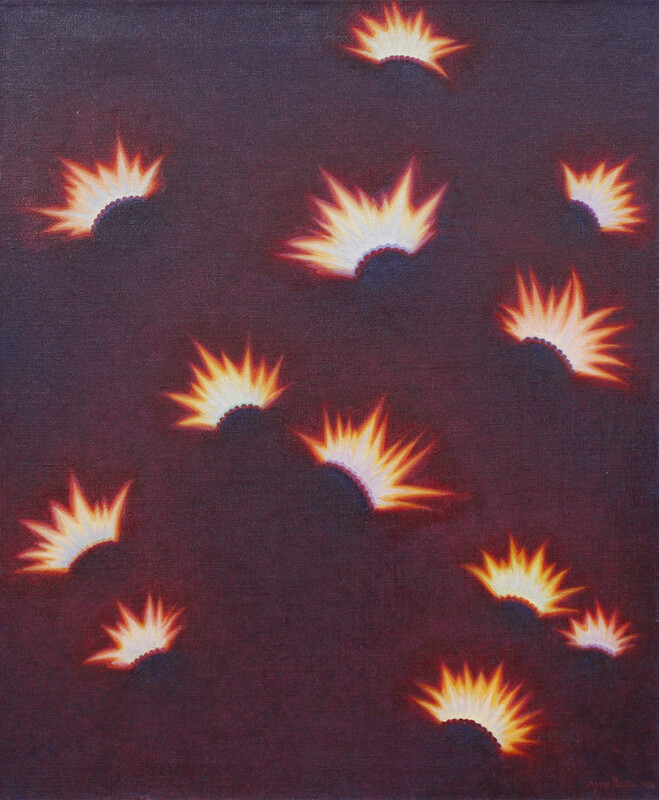 The work, a rare oil on canvas titled “Fires in Space,” was one of a small number executed by Pelton while she was living in Cathedral City, Calif., and working as part of the Transcendental Painting Group (TPG). Without any previous similar works having sold at auction upon which to base their estimate ($4/8,000), Stair Galleries priced the work in line with estimates for Pelton’s representational landscape paintings. Speaking after the sale, Stair Galleries’ specialist in fine art, Lisa Thomas, said two bidders competed for it before it went to a trade buyer bidding on the phone. The painting came from the estate of Jean Stein, who was the daughter of Hollywood entertainment legend, Jules Stein and a noted oral historian in her own right. A significant portion of Stein’s estate was sold at Sotheby’s in the fall of 2017. Stair Galleries is selling more of Stein’s collection in their upcoming March 2 sale. For additional information, 518-751-1000 or www.stairgalleries.com.